English lavender (Lavandula angustifolia), with its aromatic leaves and flowers, is often considered an herb, but it is actually an herbaceous perennial with a semi-woody growth habit. A member of the mint family, its woody stems are often cut back to ground level each year. It is often grown to produce leaves and flowers to dry for sachets and potpourris, but it is also a very attractive garden plant with vibrant purple flowers. This plant is typically 2 to 3 feet tall, with narrow, gray-green leaves (to 2 1/2 inches long) on square stems. The bluish-purple flowers appear late spring to early summer. In warmer climates, the leaves may be evergreen. This plant provides good mid-summer color to the garden and is often used in perennial borders, rock gardens, as well as in herb gardens and scent gardens. Its intermediate height makes it just about right for the middle row in a decorative border comprised of shorter annual flowers in the front and taller shrubs or trees in the back. It also works well when massed, and is sometimes used as a low hedge. This aromatic plant is very attractive to butterflies, and also has the advantage of repelling deer. English lavender must be planted in a relatively sandy, well-drained soil; damp soils frequently cause root rot. Strive for a soil similar to its native Mediterranean region; adding organic material to the soil is not only unnecessary but may cause problems. To combat humidity problems, it is best to mulch them with rock or gravel rather than organic mulch. Space the plants 1 to 3 feet apart. If desired, prune the plants back to within 8 inches of the ground in early spring to control the size of the plant and promote new growth. At the northern edge of the hardiness range, these plants should be protected over winter with a thick layer of mulch until spring. Grow English lavender in full sun. Shady locations usually cause the plant to get leggy, with lowered flower production. In very hot climates, though, the plants respond well to some shade in the heat of the afternoon. This plant likes sandy, somewhat dry soils with a slightly alkaline pH. Young plants should be watered well, but once established they are quite drought-tolerant and don't like too much water. These plants grow best in conditions that are warm but not oppressively hot, and which are relatively dry. They respond poorly to very humid weather conditions. Feeding is usually not necessary with English lavender. Lavender is best propagated through stem cuttings. Cut 6-inch long shoots, remove the lower leaves, dip the cut end in rooting hormone, then plant in a pot filled with potting soil or sand. Keep the cuttings in a partial shade location and water frequently until they are well rooted. Lavandula angustifolia 'Hidcote' is a lower variety (about 20 inches) with a mounded growth habit. L. angustifolia 'Hidcote Giant' is a larger version, achieving a height of 36 to 40 inches. L.angustifolia 'Munstead' is a short, 12-inch-tall variety with flowers that combine blue, lavender, pink, and purple. L. angustifolia ' Sarah' is a 6- to 24-inch tall cultivar with violet flowers. L. angustifolia 'Jean Davis' has light-pink flowers and grows to 20 to 24 inches. Mention of this old favorite immediately brings to mind the use of its aromatic quality to lend a fragrance to linens, sachets, and potpourris. To dry this perennial plant, harvest the flowers just as they open, then hang them to dry in a dark room with plenty of ventilation. 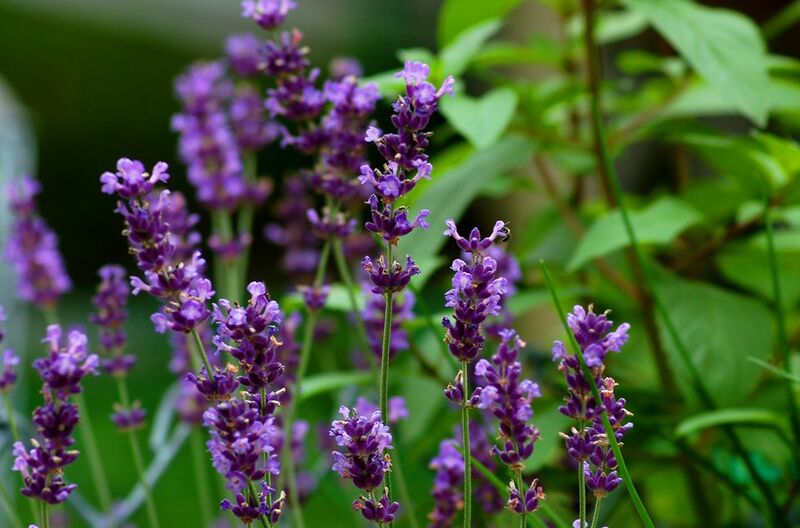 English lavender plants have also been used as a flavoring herb (for example, in cordials) and as a medicinal herb (for example, in aromatherapy for sleep). English lavender is susceptible to leaf spot and root rot. Plants may not survive in winter if soils are not well-drained and/or if temperatures dip below zero degrees without protective snow cover or mulch. The "French" variety of lavender (Lavandula stoechas) prefers a warmer climate; it is not as cold-hardy. And it is somewhat more sensitive and less durable that English lavender. Because nursery labeling is sometimes imprecise, make sure you are buying true English lavender (Lavandula angustifolia), especially if you live in the northern part of the hardiness range.